By Albert Hague. Arranged by Francesca Marzolino. Sheet Music Single. 5 pages. Published by Francesca Marzolino (H0.431935-216843). 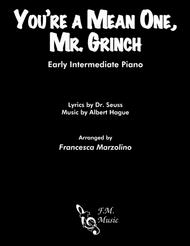 You're a Mean One, Mr. Grinch arranged for early intermediate piano solo by Francesca Marzolino.